There are places everybody’s heard of, so everybody goes to, and others that you discover just by accident. 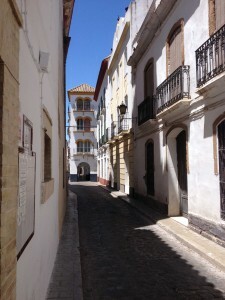 Recently, without ever really having planned it, I found myself spending a week in Écija. Where is Écija? It’s in the middle of the dusty plains of Andalusia, roughly halfway between Seville and Córdoba. Mention it to any Spanish person and they’ll near-inevitably say, ah, la sarten de España, ‘the frying pan of Spain ‘, because it’s known for having the highest average temperatures in the whole country (the local record is about 48ºC/118ºF; it didn’t reach that last week, but, since summer has come early to Andalusia, it was regularly around 38ºC/100ºF). Though the same people have probably never been there themselves. 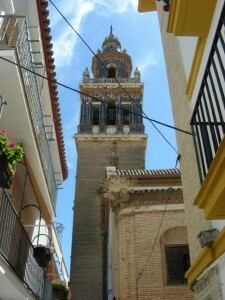 Écija is a classic Andaluz small town of intertwining whitewashed alleyways and squares picked out with yellow-painted details, and tiled, flower-pot filled patios glimpsed through metal-grilled doorways. It’s actually a lot like the arch-famous Barrio de Santa Cruz in Seville, but without all the overpowering intensity of the crowds, the tat-souvenir shops and the endless bars with English menus. Parts of it, especially the main square, the Plaza de España, better known to locals just as El Salón, look very Latin American. Anyone familiar with colonial cities in Mexico will see in Écija, much more clearly than in the bigger Andalusian cities today, a vivid indication of where they got their patio-style architecture from. With the difference that Écija has a street plan provided by the Arab rulers of Al-Andalous around the year 1000, and so made up of a maze of twisting alleys rather than the rectangular grid the Spaniards imposed in the Americas. Local pride goes with the territory in Andalusia, and Écija, out in its roasted plain, feels a little hard done by that it’s not more widely appreciated. When I mention to a waiter that I’m going to visit nearby Carmona, with its medieval walls and castle, I’m told that ‘Écija has more historic buildings than Carmona, you know’. Times are hard in Andalusia, and in many of Écija’s many monuments there are pairs of attendants paid I-imagine-not-much by the town to wait patiently to orientate the occasional visitor. The vigilante of the church of San Juan Bautista is very keen to make sure that I know (among other things) that Écija was one of the four capitals of Roman Andalusia, with Seville, Córdoba and Cádiz. And it’s true: 2,000 years ago Écija, in Latin Astigi, was a major city in one of the richest provinces of the Roman empire. When it was decided in the mid-1990s to dig up the plaza of El Salón, provide it with neat new urban furniture and create an underground car park, the first scrapings below the surface revealed the scale of the centre of the Roman town, in the remains of temples, baths, streets and houses. 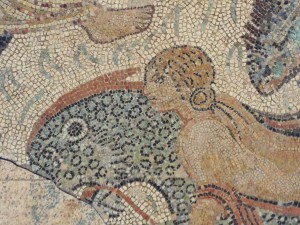 Superb relics were unearthed too, such as an exquisite statue of a Wounded Amazon and, above all, several fabulous mosaics. 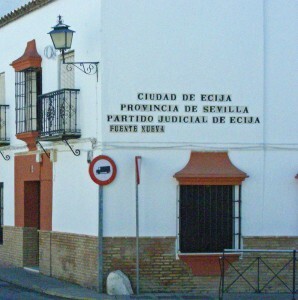 Work came to a dead halt to give way to archaeological diggings for several years, until in 2006 Écija came in for a certain amount of bad press and accusations of being philistine clods when the town authorities insisted on reclaiming the plaza, calling a halt to the excavations and installing their car park – although, in Écija’s defence, it could be said that had it really been decided to preserve and expose the remains of Astigi they would have had to knock away the whole town centre and turn it into an archaeological park, something you can’t really expect one small town to do, at least not without massive compensation. And, in some recompense, all the main relics and mosaics are now finely displayed in the (free) town museum in the Palacio de Benamejí, a grand Renaissance palace. 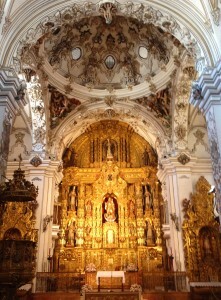 After it was seized from its Muslim emirs in 1240 Catholic Écija reached its greatest splendour in the 17th and 18th centuries, when it acquired even more baroque churches than the Andaluz norm, so much so that they developed a style of their own that has been called barroco ecijano, characterised in particular by the tall church towers with multi-coloured tiled and painted crests that are the town’s prime landmarks (although there’s only one, San Juan, that you’re usually allowed to go up for a full overview of the urban landscape). And inside, of course, the churches are suitably lavish. Andaluz baroque has to be a matter of taste – for some it inspires awe, but if you have any trace of unknowingly ingrained Protestant sensibilities (like me) it’s very hard not to look at all those glittering altarpieces and gasping saints and think of an over-wrought cream cake – but Écija certainly has truly spectacular examples, above all the church of the Descalzos, oddly plain outside but dazzling within, with explosively elaborate whipped-cream mouldings in grey and white to complement the usual gleaming gold altars. There are also still several closed convents inside the town, where the Nuns make celebrated cakes that are sold to the public at set times during the day. Around the churches and monasteries, the local aristocracy built themselves suitably grand residences in similar Spanish golden-age styles. 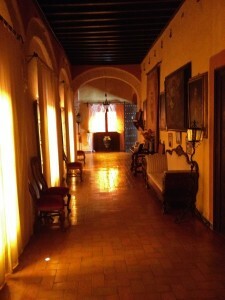 They’ve survived less unaltered than the churches, and most are now public buildings (like the Benamejí), but one is still privately owned, the huge Palacio de la Palma, with shaded patios, darkly-furnished rooms and long corridors that give a fine sense of faded grandeur. It is open to visitors, but to get in you have to ring the bell and wait for the housekeeper, who unless you turn up on an unusually busy day (I doubt very much these come round often) will look at you slightly surprised before remembering to ask for your 3 euro ticket price. Restaurante Amrita, C/Emilio Castelar 13, www.restauranteamrita.com. Sophisticated, original tapas (yes, even in Écija) with great ingredients, at ridiculous prices. The revuelto de chocos en su tinta (scrambled egg and small squid in their ink) with couscous and a lovely smooth all i oli is fabulous. Charming service couldn’t be better either. Hispania, Pasaje Vírgen del Soterrano 3. www.hispaniacafe.com. Similarly varied tapas, just not quite as good or as charming. El Cucharón, Avenida María Auxiliadora 8A. Exceptional range of quality tapas (in generous sizes) for a small local bar. 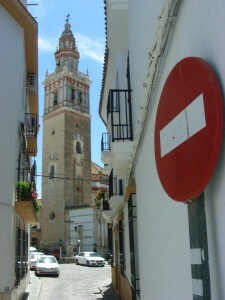 Mesón el Chato, Avenida María Auxiliadora 1. Fine for a bargain traditional lunch. Amazing how much you find out about a small place when you stay there by accident. Great piece, Nick. I must go and have a sizzle in the ‘frying pan’. Great post, lots of interesting history I didn’t discover on my one brief visit. Must go back, though not in summer! Very glad you liked it… and I think it’s a bit cooler there now than it was last week! Really enjoyed the piece, Nick. 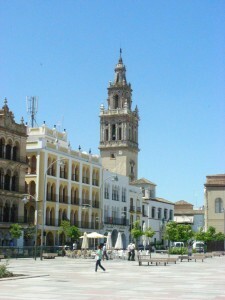 Have visited and stayed for long periods in Seville and visited Cordoba, but missed out on Ecija. Will definitely be on the radar for our next trip down south, hopefully when it is simmering rather than boiling. Just caught up with this piece which I found fascinating. I thought i knew all the areas around the Moorish triangle, but this one is new to me. 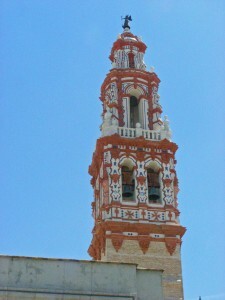 Will go visit it on next trip to Spain. Thanks for bringing it to everyone’s attention.